In many cases, the egg quality is not good. This is leads to failure of repeated cycles of treatment. In these cases using donor eggs treatment is the answer. There are also many women who have attained menopause however in these women uterus can be made healthy after hormonal preparation. Donor egg IVF would lead to very high chance of successful pregnancy. Donor eggs are obtained from three sources. They can be someone from your family, professional donor or egg sharing. The advantage of professional donor is that you will get higher number of eggs for the IVF treatment therefore chance of success is higher. The disadvantage is that it is more expensive and these donors come from middle to low socio economic class. The chance of success with donor egg cycle is about 50% per attempt and 80% in 2-3 attempts. The donor is matched according to height, weight, skin color, eye color and hair color and other physical characteristics. The attempt would be to make the child look as similar to the parents. However one must realize that even brothers and sisters in the same family may look very different even though they are from the same genetic parents. The treatment would start one month prior to your estimated month of IVF cycle. We would need to match the donor’s cycle with preparation of your endometrium. The preparation of the endometrium may take between 2-6 weeks, in many cases we can do them through e-mail communication if you are based outstation. The process involves stimulating the donor with gonadotropin injection for10-12 days followed by egg retrieval On the day of egg retrieval the husband sperm sample is collected, the egg and the sperms are fertilized in the lab and the recipient (patient) is called 2-3 days later to transfer the embryos. There are many women suffering from poor egg quality. 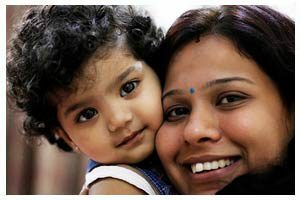 In these cases using donor eggs treatment is the answer. There are also many women who have attained menopause however in these women uterus can be made healthy after hormonal preparation. Donor egg IVF would lead to very high chance of successful pregnancy. The chance of success with donor egg cycle is about 60% per single attempt and 90% in 3 attempts. The sources of the egg donors are from verified agencies. They could be from lower to middle class background or could even be college educated. All the necessary blood screening tests including HIV and Thalassemia profile is done. After proper screening ,they are selected as egg donors. We will be able to share their profiles if you so desire. All eggs from one donor can come to you or it can be shared with another patient. The advantage is that the cost is lower with shared egg donation . The disadvantage is that you do not get a frozen cycle if the first cycle is unsuccessful with shared egg donation. The donor is matched according to height, weight, skin color, eye color and hair color and other physical characteristics. The attempt would be to make the child look as similar to the parents. However one must realize that even brothers and sisters in the same family may look very different even though they are from the same genetic parents. We have donors from all parts of the country to match with the physical profile of each couple. This is started once all blood tests of recipient and screening processes like ultrasound are normal. If any abnormality like fibroid etc. are detected, it is corrected before proceeding to IVF. The recipient is prepared with either estrogen tablets or Lupron and estrogen tablets. It takes anywhere between 2-6 weeks depending on protocol selected. On the day of egg retrieval the husband sperm sample is collected, the egg and the sperms are fertilized in the lab and the recipient (patient) is called a few days later to transfer the embryos. The treatment would start one month prior to your estimated month of IVF cycle. We would need to match the donor’s cycle with preparation of your endometrium. The preparation of the endometrium may take between 2-6 weeks.If you collect your medications from us in advance your stay can be reduced from one month to a week to 10 days around the time of embryo transfer. The total number of visits may vary from 3-6 usually. There is no overnight hospitalization. Embryo transfer is a day care procedure. Husband needs to come on day of egg pick up or freeze sperms beforehand.